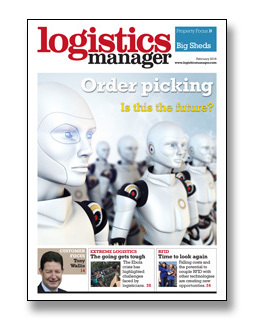 The February 2016 issue of Logistics Manager is out now on iPad and Android, as well as in print. Nowhere is the impact of multichannel retail more apparent than at the pickface. New energy saving technologies and innovations could pave the way to environmentally friendly warehouses, and save money. IT: What about the workers? The growth of multi-channel operations has increased the level of labour intensive operations for many companies. Can workforce management systems help reduce costs? The market has swung in favour of landlords and rents are increasing, but speculative starts last quarter hit their highest level since the start of 2007, so it is not all bad news for the occupier. Imagine a blowout while your truck is being shot at in enemy territory with vital chilled medicines warming in the trailer. RFID technology has not taken off in the way many expected just a few years ago, but the cost is coming down, and the potential to couple it with other technologies means that new opportunities are opening up. More and more we are hearing about disruptive technologies, so how long will it be before someone disrupts the logistics sector? This and other issues were discussed by our experts at the recent round table sponsored by OpenMarket.